I have a confession to make. Ready? Here it is: I own two small dogs some might call yippy. They wear clothes. They sleep on my bed. It's true. I don't personally think they bark to excess, but certain neighbors disagree. And I will admit my two black and tan miniature pinschers do a remarkably good job of impersonating big, burly guard dogs as they jump up trying to nip the knees of passing strangers. But barks are a complicated subject - and I don't just mean in neighborhood relations. They hit home in videogames too, which is where my diatribe comes in. This is something I'm passionate about. I've spent a lot of time with these dogs, and I know them well. I can tell from the other end of the house which dog is barking and at what they are barking. I can tell the difference between the full-chested alarm bark and the chuff of naming normal things out the window. "There's a bird. There's a bug. OMFG, THERE'S A BIKE! LET ME AT IT!" The neighbors? They just hear "Bark! Bark! Bark!" no matter what the dogs are actually saying. And I can see how that might get annoying, if all you heard for hours at a time was the same identical noise drilled into your eardrum over and over again. I know how it feels. You see, I play videogames. I've spent hours listening to characters repeat their lame catch-phrases a million times in a row as I mow down enemies and fall off cliffs repeatedly. (I'm as much a klutz in games as I am in real life.) All games do this to a certain extent when novices have to repeat the same section of the game over and over until they get it right. But the worst offenders bombard you with filler dialogue even when you're moving along at a respectable pace. Appropriately enough, behind the scenes in videogame development circles these short, repetitive bits of dialogue are even called "barks." Basically anything you pay the voice actors to say that isn't part of the story is a bark. 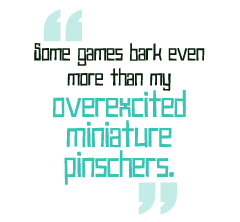 And some games bark even more than my overexcited miniature pinschers. One of the most recent, egregious examples is Mercenaries 2. You take a lot of bullets in the game, and each time you hear exactly the same delivery of "That stings a little," over and over, ad nauseum. Even worse, male and female playable characters have exactly the same lines to bark. And I hear that a co-op play session makes you listen to, "Tell Solano I'm coming for him," every 30 seconds in two different voices - even after Solano is dead. Unforgiveable!